Often associated with a plaid pattern, flannel is made from cotton, wool or synthetics and is a thicker, warmer material than plain cotton. This soft fabric features a loose, stitching technique and does not wrinkle easily. 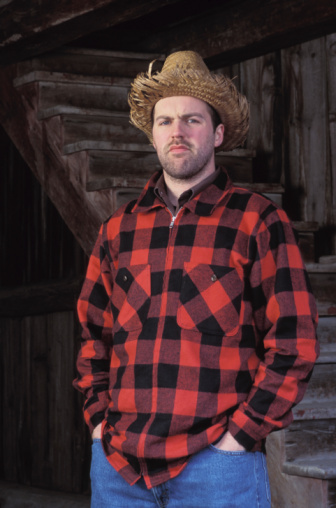 Flannel is used for clothing and bedding, such as sheets, shirts or quilting squares. Shrinking flannel depends on the fabric blend. Flannel is softer and thicker than plain cotton. Look at the label of the flannel material to see if it has been preshrunk. If so, additional shrinkage will be minimal as opposed to not having been preshrunk. Wash your flannel in the washing machine on the hottest water setting. Add a color-safe detergent and wash the flannel by itself to prevent color bleeding onto other garments. Place the flannel into the dryer using the hottest setting. Remove the flannel promptly when drying is complete. The flannel may shrink as much as 13 percent. Christina Martinez has been writing professionally since 2007. She's been published in the California State University at Fullerton newspaper, "The Daily Titan." Her writing has also appeared in "Orange County's Best" magazine. She holds a Bachelor of Arts in communications and print journalism from California State University. How Do I Unshrink Couch Cushion Covers?